Travelling today we discovered that all the hotels in Urbana are full, due to a softball tournament, so this will be short. One thing that a couple of relatively gentle Hurricane seasons lulls us into forgetting, is that when the nucleating storms start to crank up, they can come quite regularly for a significant period of time. Back in 2005, for example, the National Hurricane Center ran out of normal alphabetical names for the storms. 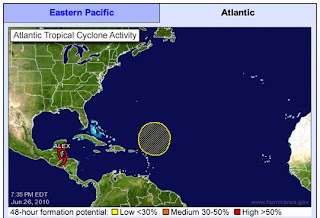 I mention that because, while Alex, the first storm of the season, is now landing and crossing the Yucatan Peninsula, there is already another area of concern forming in the Atlantic. For the first 12 hours on June 26 (midnight to noon), approximately 7,570 barrels of oil were collected and approximately 4,070 barrels of oil and 28.3 million cubic feet of natural gas were flared. and approx. 54.5 million cubic feet of natural gas were flared. Total oil recovered from both the LMRP Cap and Q4000 systems since they were implemented is approx. 391,000 barrels. An additional 22,000 barrels were collected from the RIT tool earlier in May bringing the total recovered to approx. 413,000 barrels. BP has finished installing the first free standing riser, which has greater survivability than a fixed riser and will be connected to a third vessel arriving at the site of the wellbore next week, the Helix Producer—a redundancy measure also taken under the direction of the federal government. The relief well has reached a point where the well needs to be cased and lined, and that is in hand. As the depths get closer to that of the original well (RW at 16,400 ft original well 18,000 ft) I suspect that there may be a little more care than usual taken to ensure that this cement job is good. And once that is complete, then as the drill begins to advance further the “ranging”operation will continue. 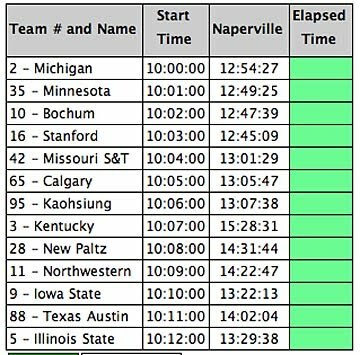 Results for the last stage of the Solar Car Race. These numbers should be added to those after the second stage. They show that Michigan won the race. Minnesota was second and the German team from Bochum third. And so, as the ROVs work to attach new risers to the well, and prepare for a cap change later in the week, we will move on. Sorry that the temperature data is missing again this week, but now that the RAW data is available I would like to more closely look at it before putting another post up on the topic. "To date, the administration has leveraged assets and skills from numerous foreign countries and international organizations as part of this historic, all-hands-on-deck response ..."
There are lies, damned lies, and Obama Administration statements. Living partly below sea-level, the Dutch are the best-prepared people in the world for these kinds of disasters. After the blowout, the Dutch offered to send large capacity oil skimmers and equipment to build berms to protect the coastline. The Obama Administration refused the help. "The U.S. government responded with "Thanks but no thanks," remarked Visser, despite BP's desire to bring in the Dutch equipment and despite the no-lose nature of the Dutch offer --the Dutch government offered the use of its equipment at no charge." It is bad enough that the Obama Administration has failed to stop the oil spill hitting the US shore. It is worse that now the Obama Administration lies about its (in)actions.